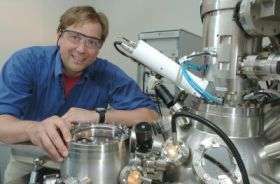 New research led by the U.S. Department of Energy's Argonne National Laboratory physicist Matthias Bode provides a more thorough understanding of new mechanisms, which makes it possible to switch a magnetic nanoparticle without any magnetic field and may enable computers to more accurately write and store information. Bode and four colleagues at the University of Hamburg used a special scanning tunneling microscope equipped with a magnetic probe tip to force a spin current through a small magnetic structure. The researchers were able to show that the structure's magnetization direction is not affected by a small current, but can be influenced if the spin current is sufficiently high. Most computers today use dynamic random access memory, or DRAM, in which each piece of binary digital information, or bit, is stored in an individual capacitor in an integrated circuit. Bode's experiment focused on magneto-resistive random access memory, or MRAM, which stores data in magnetic storage elements consisting of two ferromagnetic layers separated by a thin non-magnetic spacer. While one of the two layers remains polarized in a constant direction, the other layer becomes polarized through the application of an external magnetic field either in the same direction as the top layer (for a "0") or in the opposite direction (for a "1"). Traditionally, MRAM are switched by magnetic fields. As the bit size has shrunk in each successive generation of computers in order to accommodate more memory in the same physical area, however, they have become more and more susceptible to "false writes" or "far-field" effects, Bode said. In this situation, the magnetic field may switch the magnetization not only of the target bit but of its neighbors as well. By using the tip of the Scanning Tunneling Microscope (STM), which has the potential to resolve structures down to a single atom, the scientists were able to eliminate that effect. Bode and his colleagues were the first ones who did such work with an STM that generates high spatial-resolution data. "If you now push just a current through this bit, there's no current through the next structure over," Bode said. "This is a really local way of writing information." The high resolution of the STM tip might enable scientists to look for small impurities in the magnetic storage structures and to investigate how they affect the magnet's polarization. This technique could lead to the discovery of a material or a method to make bit switching more efficient. "If you find that one impurity helps to switch the structure, you might be able to intentionally dope the magnet such that it switches at lower currents," Bode said. Results of this research were published in the September 14 issue of Science and related research was published earlier this year in Nature.